The all-new Thrustmaster racing wheel! 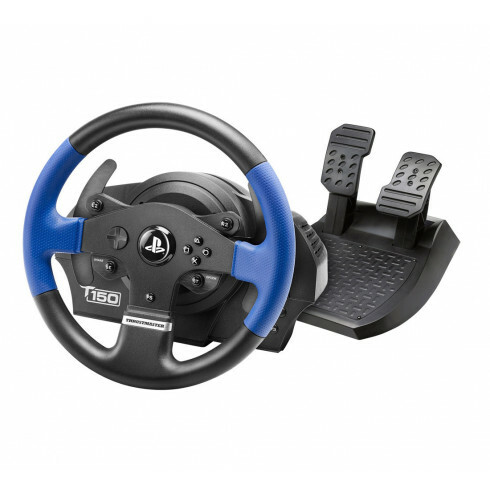 This high quality racing wheel is compatible with PlayStation 3 and 4 and PC, so with the Thrustmaster T150 RS you are ready for next gen racing! Drive system with adjustable Force Feedback lets you feel every detail while you’re racing: the road or track’s relief, loss of tire grip, braking, bumps and impacts, etc. Built-in official buttons for PlayStation®4 (PS/SHARE/OPTIONS): access social functions, switch between the game and the system, navigate through the console’s menus, etc. Bought this and the Playseat® Evolution Black for my partner's birthday. Firstly ordering and delivery were super smooth. Ordered late in the afternoon, direct delivery the next day. I was concerned the seat would not be big enough or long enough for him (He is 190cm) but all was well. Both items are top quality. On the technical side of things he reports that all is well and I can confirm many happy hours are being spent using both. This has taken his love for racing games to the next level.